Shared with me by friend Charlotte (‘Lotte), these stuffed tomatoes are full of flavour and a great make-ahead dish. Charlotte served this with a fresh greek style salad and spinach pie. It was a perfect Greek inspired meal. Remove the stems from the tops of your tomatoes. 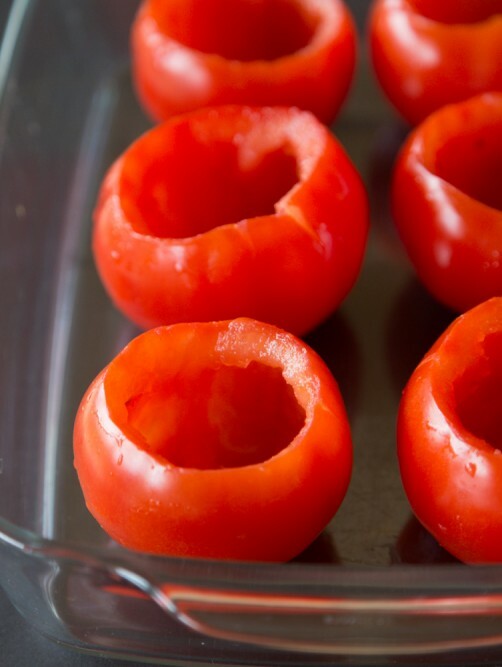 Cut a lid off the top of each tomato and scoop out the inside with a spoon, reserving both the lids and pulp. In a large skillet, heat the olive oil over medium heat. Add the garlic and onion and sauté until softened, about 3 – 5 minutes. Add the minced meat and sauté until browned. Crumble the bouillon cube into the skillet and stir to evenly distribute. Add the cumin and stir well. 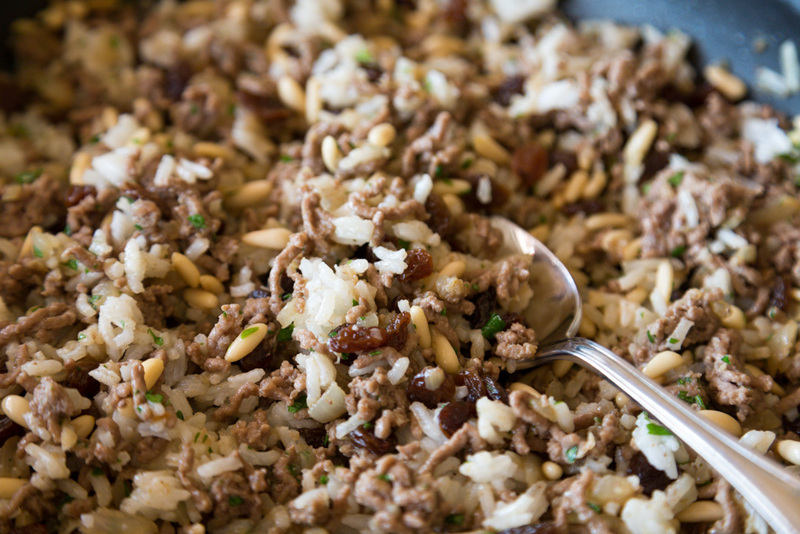 Turn off the heat and add the rice, raisins, pine nuts and parsley. Allow the mixture to cool slightly. If you find the mixture dry, add some of the reserved tomato pulp. You want the mixture to be slightly moist, but without any liquid sitting in the pan. Stuff the hollowed out tomatoes with the cooled meat mixture. Add some olive oil to a small, shallow bowl and breadcrumbs to a separate shallow bowl. Dip each tomato lid in the olive oil to moisten, followed by the breadcrumbs. Place each lid on top of each tomato. Arranged the stuffed and topped tomatoes in a roasting tin or oven-proof glass dish. If using, scatter the parboiled small potatoes around the tomatoes to help keep them upright. Drizzle olive oil over the potatoes. Transfer to the oven and bake for 30 minutes, or until the tomatoes are soft and the breadcrumbs have browned. Serve warm.